I think it pisses God off if you walk by the colour purple in a field somewhere and don't notice it. You got to fight them, Celie, she say. I can't do it for you. You got to fight them for yourself. I don't say nothing. I think bout Nettie, dead. She fight, she run away. What good it do? I don't fight, I stay where I'm told. But I'm alive. You a low down dog is what's wrong. It's time to leave you and enter into the creation. And your dead body just the welcome mat I need. They calls me yellow like yellow be my name. They calls me yellow like yellow be my name. But if yellow is a name Why ain't black the same. Well, if I say Hey black girl Lord, she try to ruin my game. Keep in mind always the present you are constructing. It should be the future you want. There is always a moment in any kind of struggle when one feels in full bloom. Vivid. Alive. One might be blown to bits in such a moment and still be at peace. But if by some miracle and all our struggle, the earth is spared, only justice to every living being will save humankind. To me war is something to be outgrown, recognized as immature, wasteful, and so destructive to life that human beings should shun it... as they once shunned bubonic plague. Yoga means to bind back, unite. To bring the body and the soul together. For this reason the practice of yoga is a holy endeavor and the teaching of it to our people a very high calling. It is the song of the people, transformed by the experiences of each generation, that holds them together, and if any part of it is lost the people suffer and are without soul. It is healthier, in any case, to write for the adults one's children will become than for the children one's 'mature' critics often are. Bio: Alice Malsenior Walker is an American novelist, short story writer, poet, and activist. 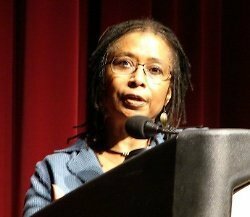 She wrote the critically acclaimed novel The Color Purple for which she won the National Book Award and the Pulitzer Prize for Fiction.